(Note: The LSE, UCL, Oxford and Warwick remain in the Top 5 in both of the above rankings). research environment (15%) looking at vitality and sustainability. The weighting of these elements forms the overall quality profile. Each area is classified as four star, three star, two star, one star or unclassified. In the area of outputs which account for 65% of the overall scores, Economics at Warwick is ranked joint 3rd with LSE just behind University College London and The University of Cambridge. 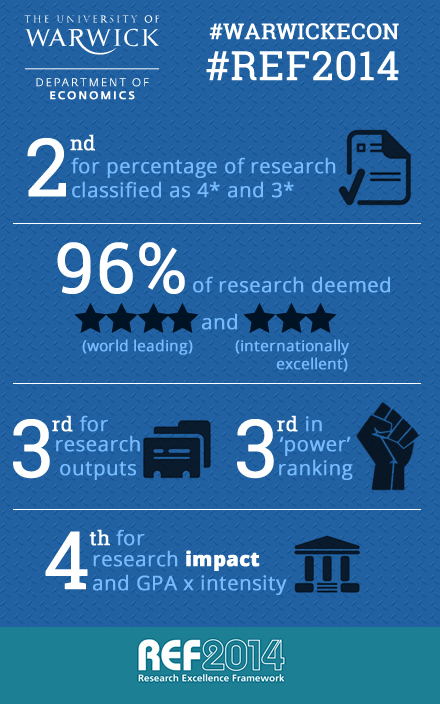 We are also ranked 3rd for research 'power'. Impact is a new area to be assessed for the REF and we are ranked 4th in this category ahead of both Oxford and Cambridge. The rankings underscore the rapid ascent of the Department of Economics into the top tier of the discipline’s research engines in the nation. In our scant 49-year history, the Department has built an outstanding research performance on the sheer quality of its faculty members and their scholarship which is clearly evidenced by our exceptional achievement. The REF results swiftly follow our number one ranking in The Times and Sunday Times’ league tables for 2015 confirming our position as the top Economics Department in the UK. We are really pleased with the results of the REF which cement our position as one of the leading departments in the UK for research excellence. High-calibre research is central to all we do at Warwick and I congratulate every member of staff in the department who has directly or indirectly contributed to this success. Economics at Warwick is always forward-facing and we will continue to build on this achievement in the years ahead. The REF is the prestigious government exercise undertaken by the four higher education funding bodies and designed to assess the quality of research in UK higher education institutions (HEIs). The REF was completed in December 2014 and it replaced the Research Assessment Exercise (RAE) which was last completed in 2008. The REF is extremely important to HEIs as it is used to allocate funding and is used in university league tables and benchmarking. The assessment also provides accountability for public investment in research and produces evidence of the benefits of this investment. GPA - Grade point average. Intensity - Staff submitted/eligible staff.